I'm here with another new card I created as a guest design team member for Quick Creations! 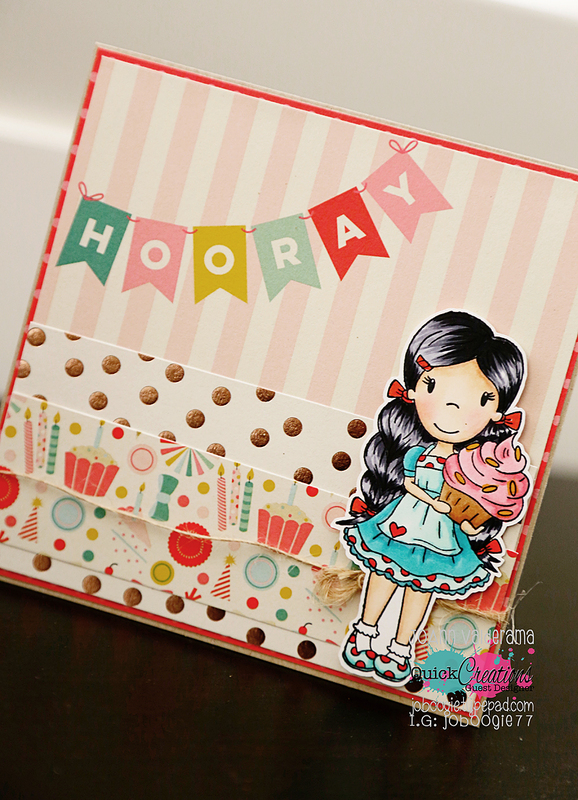 For my card today I used "Cupcake Avery" from The Paper Nest Dolls! I colored her up with my Copics and paired her up with some My Mind's Eye "Hooray" paper. And I just love having birthday cards on hand, too. :) She's so perfect for, not only little kids, but big kids and adults too! Thanks so much for stopping by! Be sure to come back tomorrow - I'll be back with my last project as a DT member for Stamp Anniething. :) There will be lots of changes coming to my blog in 2017 so stay tuned! I'm back with a new card to share with you today as a Guest Designer for Quick Creations! Today's card features the adorable Paper Nest Dolls "Owl Always Love You" stamp. Thanks so much for stopping by today and checking out my project! I've got a few more cards to share with you in the coming weeks so stay tuned!